Come play a game of bocce ball! A great way to spend a Saturday morning, this easy-to-play lawn game has roots in ancient games played in the Roman Empire. A set of bocce balls is composed of 8 large bocce balls (4 of one color and 4 of another color) and one smaller ball called the ”Pallino”. The sport is played between two teams with from 1 to 4 players on each team. The object of the sport of Bocce is for a team to get as many of their balls as close to the pallino as possible. Begin the match with the flip of a coin between teams. The winner of the coin flip has the first toss of the pallino and chooses the color of the team’s balls. A team member throws the pallino and rolls the first bocce ball as close to the pallino as possible. (The pallino must end up across the centerline and at least 12 inches away from the sideboards or backboard without hitting the backboard. If a thrower fails to do this, the pallino throw goes to other team. If the second throw fails to place the pallino into play, the pallino is placed approximately in the center of the spocking foul line at the opposite end of the court . The original thrower of the pallino always throws the first bocce ball. ) Next, a player of the opposing team rolls a ball and tries to get closer to the pallino. A team must continue to roll their bocce balls until it gets closer to the pallino than the closest ball of their opponents. Players must deliver all balls from behind the pointing foul line. Balls may be bounced or played against the sideboards. A bocce ball hitting the backboard without first touching the pallino or another bocce ball is a dead ball and is removed from play. While the object is to get close to the pallino, it is permissible for a player to play the ball in order to knock away an opponent’s ball. 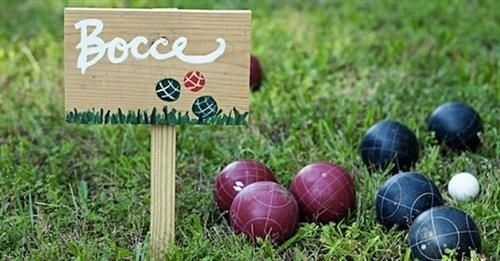 A player “hitting” or “spocking” the opponent’s ball must release the bocce ball before crossing the spocking foul line. Likewise, a player may play a ball so as to knock or move the pallino toward another of their own team’s balls. The pallino is live anywhere on the court, except if it comes back behind the mid-court line or is knocked out of the court, at which time the frame is dead and play begins again at the opposite end. When all balls have been played, one team is awarded one point for each bocce ball closer to the pallino than the closest ball of the opposing team. Thus, a team may score 1-4 points for each end of play. The other team scores no points. If the closest ball of each team is equal in distance from the pallino, no points are awarded for the frame. The team that scores in one frame starts the next frame by throwing out the pallino and playing the first bocce ball. The game is won by the first team scoring 12 points. The game ends when the 12th point is scored and the other team has played all 4 bocce balls. If the teams play another game, the team members switch ends of the court and the winning team throws out the pallino and delivers the first bocce ball. Sign-up and join us Saturday mornings, or just come and watch!